FTP Gateway: An FTP client that takes an HTTP request with an ftp:// URI, converts it into one or more FTP commands, and then converts one or more FTP responses into the final HTTP response. Definition at line 92 of file FtpGateway.cc. Definition at line 330 of file FtpGateway.cc. References Config, debugs, Client::entry, flags, SquidConfig::Ftp, Ftp::Client::initReadBuf(), HttpRequest::method, Http::METHOD_PUT, SquidConfig::passive, password, Ftp::GatewayFlags::pasv_failed, Ftp::GatewayFlags::pasv_supported, Ftp::GatewayFlags::put, Client::request, Ftp::GatewayFlags::rest_supported, StoreEntry::url(), and user. Definition at line 366 of file FtpGateway.cc. References base_href, String::clean(), Ftp::Channel::conn, Ftp::Client::ctrl, cwd_message, DBG_IMPORTANT, debugs, dirpath, Client::entry, filepath, Comm::IsConnOpen(), MEM_8K_BUF, memFree(), NULL, old_filepath, pathcomps, reply_hdr, title_url, StoreEntry::url(), wordlistDestroy(), and xfree. References Ftp::Channel::conn, Ftp::Client::ctrl, Ftp::Client::data, debugs, Comm::Connection::fd, AsyncJob::mustStop(), and NULL. Referenced by ftpAcceptDataConnection(), processHeadResponse(), processReplyBody(), Ftp::Client::readControlReply(), and Ftp::Relay::sendCommand(). Referenced by Client::handleAdaptationAborted(), Client::handleAdaptationBlocked(), Client::handleAdaptedBodyProducerAborted(), Client::handleAdaptedBodyProductionEnded(), Client::handleAdaptedHeader(), Client::handleMoreAdaptedBodyAvailable(), Client::noteAdaptationAclCheckDone(), Client::resumeBodyStorage(), and Ftp::Client::timeout(). Referenced by Client::abortOnBadEntry(), Ftp::Client::dataRead(), Client::handleAdaptationBlocked(), Ftp::Client::readControlReply(), Client::sendBodyIsTooLargeError(), and Client::sentRequestBody(). Referenced by appendSuccessHeader(), Ftp::Relay::forwardReply(), HttpStateData::processReply(), and Ftp::Relay::startDataDownload(). Referenced by HttpStateData::decodeAndWriteReplyBody(), Client::noteMoreBodySpaceAvailable(), Ftp::Relay::processReplyBody(), HttpStateData::writeReplyBody(), and writeReplyBody(). Definition at line 2531 of file FtpGateway.cc. References Client::adaptOrFinalizeReply(), assert, StoreEntry::buffer(), SBuf::c_str(), Http::CONTENT_ENCODING, DBG_CRITICAL, debugs, Client::entry, flags, getCurrentOffset(), Http::Message::header, HERE(), Ftp::GatewayFlags::http_header_sent, httpHeaderAddContRange(), Ftp::GatewayFlags::isdir, StoreEntry::isEmpty(), HttpHdrRangeSpec::length, mdtm, mimeGetContentEncoding(), mimeGetContentType(), SBuf::npos, NULL, HttpHdrRangeSpec::offset, AnyP::Uri::path(), HttpHeader::putStr(), Client::request, SBuf::rfind(), Http::scOkay, Http::scPartialContent, HttpReply::setHeaders(), Client::setVirginReply(), Http::Message::sources, Http::Message::srcFtp, SBuf::substr(), theSize, typecode, and HttpRequest::url. 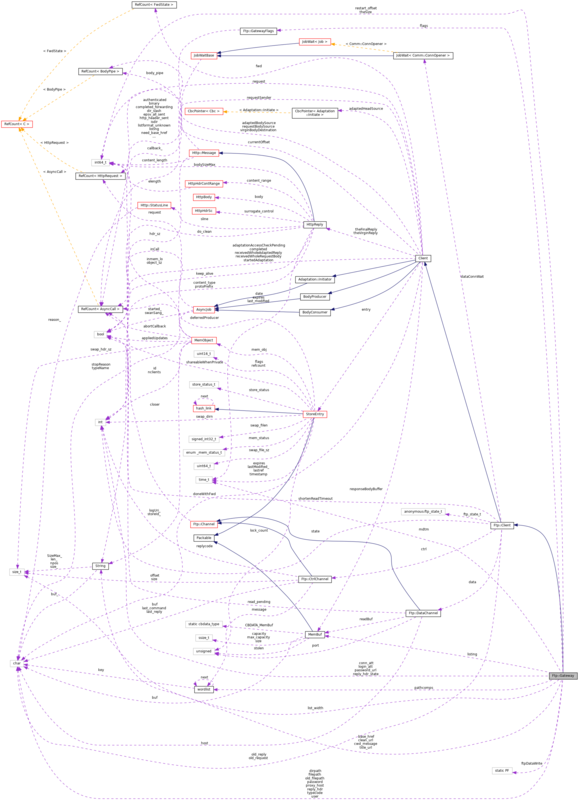 Referenced by processHeadResponse(), and processReplyBody(). Definition at line 1115 of file FtpGateway.cc. References String::append(), AnyP::Uri::authority(), base_href, AnyP::Uri::getScheme(), SBuf::length(), password, password_url, AnyP::Uri::path(), AnyP::PROTO_FTP, SBuf::rawContent(), Client::request, rfc1738_escape_part, title_url, HttpRequest::url, and user. Locates the FTP user:password login. squid.conf anonymous-FTP settings (default: anonymous:Squid@). Special Case: A username-only may be provided in the URL and password in the HTTP headers. 1 if we have everything needed to complete this request. 0 if something is missing. Definition at line 1034 of file FtpGateway.cc. References SquidConfig::anon_user, Ftp::GatewayFlags::authenticated, Http::AUTHORIZATION, Config, fatal(), flags, SquidConfig::Ftp, HttpHeader::getAuth(), loginParser(), MAX_URL, null_string, password, Client::request, Ftp::GatewayFlags::tried_auth_anonymous, Ftp::GatewayFlags::tried_auth_nopass, HttpRequest::url, user, AnyP::Uri::userInfo(), and xstrncpy(). Definition at line 1078 of file FtpGateway.cc. References Ftp::GatewayFlags::dir_slash, flags, Ftp::GatewayFlags::isdir, SBuf::length(), Ftp::GatewayFlags::need_base_href, SBuf::npos, AnyP::Uri::path(), Client::request, Ftp::GatewayFlags::root_dir, typecode, HttpRequest::url, and xtoupper. References Ftp::Channel::close(), Ftp::Channel::conn, Ftp::Client::ctrl, Ftp::Client::data, debugs, Comm::Connection::fd, Client::fwd, Comm::IsConnOpen(), and FwdState::unregister(). Referenced by Ftp::Client::failed(), Ftp::Relay::handleControlReply(), and Ftp::Relay::~Relay(). Generate the HTTP headers and template fluff around an FTP directory listing display. Definition at line 2262 of file FtpGateway.cc. References FwdState::al, assert, Ftp::Client::ctrl, cwd_message, Client::entry, ERR_DIR_LISTING, StoreEntry::flush(), ErrorState::ftp, Client::fwd, RefCount< C >::getRaw(), listing, ErrorState::listing, StoreEntry::lock(), Ftp::CtrlChannel::message, NULL, StoreEntry::replaceHttpReply(), Client::request, Http::scOkay, String::size(), String::termedBuf(), StoreEntry::unlock(), and xstrdup. A hack to ensure we do not double-complete on the forward entry. Definition at line 2692 of file FtpGateway.cc. References Ftp::GatewayFlags::completed_forwarding, Client::completeForwarding(), Ftp::Channel::conn, Ftp::Client::ctrl, Ftp::Client::data, debugs, Comm::Connection::fd, flags, Client::fwd, and NULL. References COMM_TRANSPARENT, Config, conn, Ftp::Channel::conn, SquidConfig::connect, Ftp::Client::ctrl, Ftp::Client::data, Ftp::Client::dataChannelConnected(), debugs, Comm::Connection::flags, Ftp::DataChannel::host, Comm::IsConnOpen(), JobCallback, Ftp::CtrlChannel::last_command, Ftp::CtrlChannel::last_reply, Comm::Connection::local, Comm::Connection::nfmark, Ftp::Channel::opener, Ftp::DataChannel::port, Ip::Address::port(), Comm::Connection::remote, safe_free, Comm::Connection::setAddrs(), Comm::ConnOpener::setHost(), AsyncJob::Start(), SquidConfig::Timeout, Comm::Connection::tos, and xstrdup. References Ftp::Channel::clear(), Ftp::Client::ctrl, debugs, Client::doneWithFwd, AsyncJob::mustStop(), and AsyncJob::status(). Definition at line 1727 of file FtpGateway.cc. References CommCommonCbParams::conn, Ftp::Client::data, Ftp::Client::dataCloser(), debugs, CommCommonCbParams::flag, ftpRestOrList, ftpSendPassive, HERE(), NULL, Comm::OK, Ftp::Channel::opened(), Ftp::Channel::opener, Comm::TIMEOUT, Ftp::Client::writeCommand(), and CommCommonCbParams::xerrno. Definition at line 318 of file FtpGateway.cc. Referenced by Ftp::Relay::dataChannelConnected(), dataChannelConnected(), ftpAcceptDataConnection(), and listenForDataChannel(). References Ftp::Channel::close(), Ftp::Client::data, debugs, Ftp::Client::scheduleReadControlReply(), and AsyncJob::status(). Referenced by Ftp::Relay::abort(), Ftp::Relay::abortOnData(), Ftp::Client::dataRead(), Ftp::Client::doneSendingRequestBody(), and readStor(). References Client::abortOnData(), StatCounters::all, MemBuf::appended(), assert, DelayId::bytesIn(), Ftp::Channel::conn, Ftp::Client::data, Ftp::Client::dataComplete(), DBG_IMPORTANT, debugs, EBIT_TEST, Client::entry, ENTRY_ABORTED, Comm::ERR_CLOSING, ERR_READ_ERROR, Ftp::Client::failed(), CommCommonCbParams::fd, Comm::Connection::fd, CommCommonCbParams::flag, StoreEntry::flags, IoStats::Ftp, StatCounters::ftp, ignoreErrno(), IOStats, Ftp::Client::maybeReadVirginBody(), StoreEntry::mem_obj, MemObject::mostBytesAllowed(), Comm::OK, Client::processReplyBody(), IoStats::read_hist, Ftp::DataChannel::read_pending, Ftp::DataChannel::readBuf, IoStats::reads, StatCounters::server, CommIoCbParams::size, statCounter, CommCommonCbParams::xerrno, and xstrerr(). References Ftp::Client::dataComplete(), debugs, Client::doneSendingRequestBody(), and AsyncJob::status(). References Ftp::Channel::conn, Ftp::Client::ctrl, Ftp::Client::data, and Comm::IsConnOpen(). Referenced by Ftp::Relay::failed(), haveControlChannel(), and mayReadVirginReplyBody(). References FwdState::al, Ftp::Client::closeServer(), Ftp::Client::ctrl, debugs, HttpRequest::detailError(), Client::entry, FwdState::fail(), Ftp::Client::failedHttpStatus(), ErrorState::ftp, Client::fwd, ErrorState::httpStatus, StoreEntry::isEmpty(), Ftp::CtrlChannel::last_command, Ftp::CtrlChannel::last_reply, Ftp::CtrlChannel::message, NULL, Ftp::Client::old_reply, Ftp::Client::old_request, ErrorState::reply, FwdState::request, ErrorState::request, ErrorState::server_msg, ErrorState::type, ErrorState::xerrno, and xstrdup. Referenced by Ftp::Client::dataRead(), Ftp::Relay::failed(), ftpFail(), ftpReadTransferDone(), ftpWriteTransferDone(), Ftp::Client::handleEpsvReply(), handleRequestBodyProducerAborted(), loginFailed(), Ftp::Client::readControlReply(), Ftp::Client::sendEprt(), Ftp::Client::sendPassive(), Ftp::Client::sendPort(), Ftp::Client::timeout(), and Ftp::Client::writeCommandCallback(). Definition at line 2451 of file FtpGateway.cc. References Ftp::Client::ctrl, ERR_FTP_FORBIDDEN, ERR_FTP_NOT_FOUND, ERR_FTP_UNAVAILABLE, ERR_NONE, Ftp::Client::failedHttpStatus(), password_url, Ftp::CtrlChannel::replycode, Http::scForbidden, Http::scNotFound, Http::scServiceUnavailable, Http::scUnauthorized, Ftp::Client::SENT_CWD, Ftp::Client::SENT_PASS, Ftp::Client::SENT_RETR, Ftp::Client::SENT_USER, and Ftp::Client::state. "read" handler to accept FTP data connections. When squid.conf ftp_sanitycheck is enabled, check the new connection is actually being made by the remote client which is connected to the FTP control socket. Or the one which we were told to listen for by control channel messages (may differ under NAT). This prevents third-party hacks, but also third-party load balancing handshakes. On Comm::OK start using the accepted data socket and discard the temporary listen socket. Definition at line 1923 of file FtpGateway.cc. References Ftp::Client::abortAll(), Ftp::DataChannel::addr(), assert, Ftp::Channel::clear(), Ftp::Channel::close(), Comm::Connection::close(), Config, Ftp::Channel::conn, CommCommonCbParams::conn, Ftp::Client::ctrl, Ftp::Client::data, Ftp::Client::dataCloser(), DBG_IMPORTANT, debugs, EBIT_TEST, Client::entry, ENTRY_ABORTED, Comm::Connection::fd, fd_table, CommCommonCbParams::flag, StoreEntry::flags, SquidConfig::Ftp, ftpFail, haveControlChannel(), HERE(), Comm::IsConnOpen(), Ftp::Channel::listenConn, Ftp::CtrlChannel::message, NULL, Comm::OK, Ftp::Channel::opened(), Comm::Connection::remote, SquidConfig::sanitycheck, CommCommonCbParams::xerrno, and xstrerr(). Definition at line 2629 of file FtpGateway.cc. References ErrorState::BuildHttpReply(), SBuf::c_str(), ERR_CACHE_ACCESS_DENIED, Http::Message::header, HttpHeader::putAuth(), and Http::scUnauthorized. Definition at line 1265 of file FtpGateway.cc. References SBuf::append(), SBuf::appendf(), AnyP::Uri::host(), AnyP::Uri::port(), Client::request, HttpRequest::url, and user. Referenced by loginFailed(), and start(). Definition at line 149 of file FtpGateway.cc. Referenced by appendSuccessHeader(), and haveParsedReplyHeaders(). Definition at line 2383 of file FtpGateway.cc. References Ftp::Client::ctrl, debugs, filepath, HERE(), Ftp::CtrlChannel::last_command, Ftp::CtrlChannel::last_reply, NULL, old_filepath, Ftp::Client::old_reply, Ftp::Client::old_request, pathcomps, restart_offset, setCurrentOffset(), and xstrdup. Referenced by ftpFail(), and ftpReadRetr(). Definition at line 1170 of file FtpGateway.cc. References String::append(), Ftp::Client::ctrl, cwd_message, FTP_SM_FUNCS, Ftp::Client::handleControlReply(), Ftp::CtrlChannel::message, wordlist::next, NULL, and Ftp::Client::state. References Ftp::DataChannel::addr(), buf, code, Config, Ftp::Channel::conn, Ftp::Client::ctrl, Ftp::Client::data, DBG_IMPORTANT, debugs, Ip::EnableIpv6, ERR_FTP_FAILURE, Ftp::Client::failed(), SquidConfig::Ftp, Comm::IsConnOpen(), Ftp::CtrlChannel::last_reply, NULL, port, Ip::Address::port(), Comm::Connection::remote, Ftp::CtrlChannel::replycode, SquidConfig::sanitycheck, Ftp::Client::sendEprt(), Ftp::Client::sendPassive(), Ftp::Client::SENT_EPSV_1, Ftp::Client::SENT_EPSV_2, Ftp::Client::state, and AsyncJob::status(). References Ftp::DataChannel::addr(), buf, code, Config, Ftp::Channel::conn, Ftp::Client::ctrl, Ftp::Client::data, DBG_IMPORTANT, debugs, Comm::Connection::fd, fd_table, SquidConfig::Ftp, Comm::IsConnOpen(), Ftp::CtrlChannel::last_reply, NULL, Ftp::ParseIpPort(), Comm::Connection::remote, Ftp::CtrlChannel::replycode, SquidConfig::sanitycheck, and AsyncJob::status(). Definition at line 2299 of file FtpGateway.cc. References debugs, ERR_READ_ERROR, Ftp::Client::failed(), Client::handleRequestBodyProducerAborted(), and HERE(). Have we lost the FTP server control channel? true The server control channel is available. false The server control channel is not available. Definition at line 2712 of file FtpGateway.cc. References Ftp::Channel::conn, Ftp::Client::ctrl, DBG_IMPORTANT, debugs, Ftp::Client::doneWithServer(), and Comm::IsConnOpen(). Referenced by ftpAcceptDataConnection(), ftpReadPORT(), ftpSendCwd(), ftpSendList(), ftpSendMdtm(), ftpSendMkdir(), ftpSendNlst(), ftpSendPass(), ftpSendPassive(), ftpSendPORT(), ftpSendQuit(), ftpSendRest(), ftpSendRetr(), ftpSendSize(), ftpSendStor(), ftpSendType(), and ftpSendUser(). Definition at line 2612 of file FtpGateway.cc. References Ftp::GatewayFlags::authenticated, Client::entry, flags, getCurrentOffset(), Client::haveParsedReplyHeaders(), StoreEntry::makePublic(), StoreEntry::release(), and StoreEntry::timestampsSet(). Definition at line 767 of file FtpGateway.cc. References SBuf::append(), SBuf::appendf(), SBuf::c_str(), ftpListParts::date, debugs, Ftp::GatewayFlags::dir_slash, dirpath, flags, ftpListParseParts(), ftpListPartsFree(), html_quote(), ftpListParts::link, Ftp::GatewayFlags::listformat_unknown, mimeGetDownloadOption(), mimeGetIconURL(), mimeGetViewOption(), ftpListParts::name, p, PRId64, rfc1738_escape, rfc1738_escape_part, ftpListParts::showname, size, ftpListParts::size, SQUIDSBUFPH, SQUIDSBUFPRINT, text, ftpListParts::type, typecode, xisspace, and xstrdup. References Ftp::Client::data, MemBuf::init(), NULL, and Ftp::DataChannel::readBuf. Referenced by Gateway(), and Ftp::Client::maybeReadVirginBody(). Definition at line 445 of file FtpGateway.cc. References assert, comm_open_listener(), Ftp::Channel::conn, Ftp::Client::ctrl, Ftp::Client::data, Ftp::Client::dataCloser(), DBG_CRITICAL, debugs, Client::entry, Comm::Connection::fd, Comm::Connection::flags, ftpAcceptDataConnection(), HERE(), Comm::IsConnOpen(), JobCallback, Comm::Connection::local, Comm::Connection::nfmark, Ftp::Channel::opened(), AsyncJob::Start(), Ftp::Client::switchTimeoutToDataChannel(), Comm::Connection::tos, and StoreEntry::url(). Referenced by ftpOpenListenSocket(), ftpReadList(), ftpReadRetr(), and readStor(). Translate FTP login failure into HTTP error this is an attmpt to get the 407 message to show up outside Squid. its NOT a general failure. But a correct FTP response type. Definition at line 1221 of file FtpGateway.cc. References FwdState::al, ErrorState::BuildHttpReply(), SBuf::c_str(), Ftp::Client::ctrl, Client::entry, ERR_FTP_FORBIDDEN, ERR_FTP_UNAVAILABLE, ERR_NONE, Ftp::Client::failed(), ftpFail, ftpRealm(), Client::fwd, Http::Message::header, NULL, password_url, HttpHeader::putAuth(), StoreEntry::replaceHttpReply(), Ftp::CtrlChannel::replycode, FwdState::request, Http::scForbidden, Http::scServiceUnavailable, Http::scUnauthorized, Ftp::Client::SENT_PASS, Ftp::Client::SENT_USER, Client::serverComplete(), and Ftp::Client::state. Referenced by ftpReadPass(), and ftpReadUser(). Parse a possible login username:password pair. Produces filled member variables user, password, password_url if anything found. Definition at line 399 of file FtpGateway.cc. References SBuf::copy(), debugs, SBuf::find(), SBuf::isEmpty(), SBuf::length(), SBuf::npos, password, password_url, rfc1738_unescape(), SBuf::substr(), and user. References commSetConnTimeout(), Config, Ftp::Channel::conn, Ftp::Client::data, Ftp::Client::dataRead(), debugs, StoreEntry::delayAwareRead(), Client::entry, Comm::Connection::fd, fd_table, Ftp::Client::initReadBuf(), Comm::IsConnOpen(), JobCallback, SquidConfig::read, Ftp::DataChannel::read_pending, Ftp::DataChannel::readBuf, Client::replyBodySpace(), MemBuf::space(), Ftp::Client::timeout(), and SquidConfig::Timeout. Referenced by Ftp::Client::dataRead(), ftpReadList(), ftpReadRetr(), Ftp::Relay::processReplyBody(), processReplyBody(), and Ftp::Relay::startDataDownload(). Definition at line 2728 of file FtpGateway.cc. Referenced by Client::adaptOrFinalizeReply(), Client::adjustBodyBytesRead(), Client::blockCaching(), HttpStateData::finishingBrokenPost(), HttpStateData::handle1xx(), Client::noteAdaptationAclCheckDone(), readStor(), Client::serverComplete(), and Client::startRequestBodyFlow(). Definition at line 883 of file FtpGateway.cc. References MemBuf::append(), buf, MemBuf::consume(), MemBuf::content(), MemBuf::contentSize(), Ftp::crlf, Ftp::Client::data, debugs, Client::entry, HERE(), htmlifyListEntry(), MemBuf::init(), len, listing, MEM_4K_BUF, memAllocate(), memFree(), Ftp::DataChannel::readBuf, rfc1738_do_escape(), StoreEntry::url(), xfree, xmalloc, and xstrncpy(). Definition at line 2663 of file FtpGateway.cc. Definition at line 1685 of file FtpGateway.cc. References Ftp::Client::abortAll(), Client::adaptationAccessCheckPending, appendSuccessHeader(), debugs, EBIT_TEST, Client::entry, ENTRY_ABORTED, StoreEntry::flags, ftpSendQuit, HERE(), and processReplyBody(). Definition at line 967 of file FtpGateway.cc. References Ftp::Client::abortAll(), Client::adaptationAccessCheckPending, appendSuccessHeader(), MemBuf::consume(), MemBuf::content(), MemBuf::contentSize(), Ftp::Client::data, debugs, EBIT_TEST, Client::entry, ENTRY_ABORTED, flags, StoreEntry::flags, StoreEntry::flush(), HERE(), Ftp::GatewayFlags::http_header_sent, Ftp::GatewayFlags::isdir, Ftp::GatewayFlags::listing, listing, Ftp::Client::maybeReadVirginBody(), HttpRequest::method, Http::METHOD_HEAD, parseListing(), Ftp::DataChannel::readBuf, Client::request, MemBuf::reset(), Client::serverComplete(), AsyncJob::status(), theSize, and writeReplyBody(). References Ftp::Client::abortAll(), Client::abortOnData(), StatCounters::all, assert, commUnsetConnTimeout(), Ftp::Channel::conn, Ftp::Client::ctrl, DBG_IMPORTANT, debugs, EBIT_TEST, Client::entry, ENTRY_ABORTED, Comm::ERR_CLOSING, ERR_FTP_FAILURE, ERR_READ_ERROR, Ftp::Client::failed(), CommCommonCbParams::fd, fd_bytes(), FD_READ, CommCommonCbParams::flag, StoreEntry::flags, StatCounters::ftp, Ftp::Client::handleControlReply(), ignoreErrno(), Comm::IsConnOpen(), len, Ftp::CtrlChannel::offset, Comm::OK, Ftp::Client::scheduleReadControlReply(), StatCounters::server, Ftp::CtrlChannel::size, CommIoCbParams::size, statCounter, STORE_PENDING, StoreEntry::store_status, CommCommonCbParams::xerrno, and xstrerr(). Definition at line 2054 of file FtpGateway.cc. References code, Ftp::Channel::conn, Ftp::Client::ctrl, Ftp::Client::data, Ftp::Client::dataComplete(), DBG_IMPORTANT, debugs, FwdState::dontRetry(), ftpFail, Client::fwd, HERE(), Comm::IsConnOpen(), listenForDataChannel(), Client::originalRequest(), Ftp::CtrlChannel::replycode, Client::sendMoreRequestBody(), Client::startRequestBodyFlow(), Ftp::Client::state, Ftp::Client::switchTimeoutToDataChannel(), and Ftp::Client::WRITING_DATA. Definition at line 2104 of file FtpGateway.cc. References Ftp::GatewayFlags::binary, flags, HttpHdrRange::lowestOffset(), HttpRequest::range, Client::request, restart_offset, and theSize. References Ftp::CtrlChannel::buf, comm_read(), commSetConnTimeout(), commUnsetConnTimeout(), Config, Ftp::Channel::conn, SquidConfig::connect, Ftp::Client::ctrl, Ftp::Client::data, debugs, Ftp::Client::handleControlReply(), Comm::IsConnOpen(), JobCallback, min(), Ftp::CtrlChannel::offset, SquidConfig::read, Ftp::Client::readControlReply(), Ftp::Client::shortenReadTimeout, Ftp::CtrlChannel::size, Ftp::Client::timeout(), and SquidConfig::Timeout. Referenced by Ftp::Client::dataComplete(), Ftp::Client::handleControlReply(), Ftp::Client::readControlReply(), Ftp::Relay::scheduleReadControlReply(), Ftp::Client::start(), and Ftp::Client::writeCommand(). References Packable::appendf(), buf, comm_local_port(), Config, Ftp::Channel::conn, MemBuf::content(), Ftp::crlf, Ftp::Client::data, debugs, SquidConfig::eprt, ERR_FTP_FAILURE, Ftp::Client::failed(), Comm::Connection::fd, SquidConfig::Ftp, Comm::IsConnOpen(), Ip::Address::isIPv6(), Comm::Connection::local, MAX_IPSTRLEN, Ftp::Client::openListenSocket(), Ip::Address::port(), MemBuf::reset(), Ftp::Client::sendPort(), Ftp::Client::SENT_EPRT, Ftp::Client::state, AsyncJob::status(), Ip::Address::toStr(), and Ftp::Client::writeCommand(). Referenced by Ftp::Client::handleEpsvReply(), and Ftp::Client::sendPassive(). Referenced by Client::handleMoreRequestBodyAvailable(), readStor(), and Client::sentRequestBody(). References SquidConfig::accessList, allow_t::allowed(), Packable::appendf(), Ftp::Channel::close(), Config, Ftp::Channel::conn, MemBuf::content(), Ftp::crlf, Ftp::Client::ctrl, Ftp::Client::data, DBG_IMPORTANT, debugs, SquidConfig::epsv_all, ERR_FTP_FAILURE, Ftp::Client::failed(), ACLChecklist::fastCheck(), SquidConfig::Ftp, SquidConfig::ftp_epsv, Client::fwd, Ip::Address::isIPv4(), Ip::Address::isIPv6(), Comm::Connection::local, Ftp::CtrlChannel::message, NULL, Ftp::CtrlChannel::offset, SquidConfig::passive, Comm::Connection::remote, FwdState::request, MemBuf::reset(), Ftp::Client::sendEprt(), Ftp::Client::SENT_EPSV_1, Ftp::Client::SENT_EPSV_2, Ftp::Client::SENT_EPSV_ALL, Ftp::Client::SENT_PASV, Ftp::Client::shortenReadTimeout, Ftp::Client::state, AsyncJob::status(), wordlistDestroy(), and Ftp::Client::writeCommand(). Referenced by ftpSendPassive(), Ftp::Client::handleEpsvReply(), and Ftp::Relay::sendCommand(). Referenced by ftpReadQuit(), loginFailed(), HttpStateData::processReplyBody(), processReplyBody(), Ftp::Relay::serverComplete(), and start(). Definition at line 148 of file FtpGateway.cc. Referenced by ftpReadRest(), and hackShortcut(). Referenced by appendSuccessHeader(), Ftp::Relay::forwardReply(), HttpStateData::processReplyHeader(), and Ftp::Relay::startDataDownload(). Referenced by Ftp::Server::AcceptCtrlConnection(), Ftp::Server::checkDataConnPre(), clientListenerConnectionOpened(), Ftp::Client::connectDataChannel(), TunnelStateData::connectedToPeer(), FwdState::connectStart(), TunnelStateData::connectToPeer(), Adaptation::Icap::Xaction::dnsLookupDone(), Log::TcpLogger::doConnect(), FwdState::establishTunnelThruProxy(), Ipc::Coordinator::handleCacheMgrRequest(), PeerPoolMgr::handleOpenedConnection(), Ipc::Coordinator::handleSnmpRequest(), httpAccept(), httpsAccept(), httpStart(), idnsInitVC(), Adaptation::Initiator::initiateAdaptation(), listenForDataChannel(), Ftp::Server::listenForDataConnection(), Adaptation::Icap::Xaction::noteCommConnected(), Log::TcpLogger::Open(), PeerPoolMgr::openNewConnection(), peerProbeConnect(), Rock::SwapDir::rebuild(), Mgr::FunAction::respond(), Mgr::InfoAction::respond(), FwdState::secureConnectionToPeerIfNeeded(), Ipc::SendMessage(), Mgr::Inquirer::sendResponse(), snmpConstructReponse(), SquidMain(), Ident::Start(), Adaptation::AccessCheck::Start(), CacheManager::start(), Security::PeerConnector::startCertDownloading(), TunnelStateData::startConnecting(), Ftp::StartGateway(), Ftp::StartRelay(), PeerPoolMgrsRr::syncConfig(), and Rock::SwapDir::updateHeaders(). Definition at line 1148 of file FtpGateway.cc. References FwdState::al, Ftp::Client::BEGIN, buildTitleUrl(), checkAuth(), checkUrlpath(), Ftp::Channel::conn, Ftp::Client::ctrl, debugs, Client::entry, Comm::Connection::fd, ftpAuthRequired(), ftpRealm(), Client::fwd, RefCount< C >::getRaw(), Http::Message::header, AnyP::Uri::host(), password, AnyP::Uri::path(), StoreEntry::replaceHttpReply(), Client::request, Client::serverComplete(), Ftp::Client::start(), Ftp::Client::state, HttpRequest::url, and user. Referenced by readStor(), HttpStateData::sendRequest(), and Ftp::Relay::startDataUpload(). Referenced by BodyPipe::buf(), AsyncJob::callEnd(), AsyncJob::callStart(), ClientRequestContext::clientAccessCheckDone(), ClientRequestContext::clientRedirectDone(), Ftp::Client::ctrlClosed(), Ftp::Relay::dataChannelConnected(), Ftp::Client::dataClosed(), Ftp::Client::dataComplete(), Ftp::Client::doneSendingRequestBody(), Ftp::Client::handleControlReply(), Ftp::Client::handleEpsvReply(), Ftp::Client::handlePasvReply(), Ftp::Client::parseControlReply(), Ftp::Relay::processReplyBody(), processReplyBody(), Ftp::Relay::readTransferDoneReply(), Ftp::Client::sendEprt(), Ftp::Client::sendPassive(), Adaptation::Initiate::status(), Comm::TcpAcceptor::status(), and AsyncJob::swanSong(). References commSetConnTimeout(), commUnsetConnTimeout(), Config, Ftp::Channel::conn, Ftp::Client::ctrl, Ftp::Client::data, JobCallback, SquidConfig::read, Ftp::Client::timeout(), and SquidConfig::Timeout. Referenced by ftpReadList(), ftpReadRetr(), listenForDataChannel(), and readStor(). Definition at line 482 of file FtpGateway.cc. References AsyncCall::cancel(), Ftp::Channel::close(), Ftp::Client::data, DBG_IMPORTANT, debugs, flags, NULL, Ftp::Channel::opener, Ftp::GatewayFlags::pasv_supported, Ftp::Client::SENT_PASV, Ftp::Client::state, and Ftp::Client::timeout(). Definition at line 2372 of file FtpGateway.cc. References debugs, HERE(), NULL, Ftp::Client::old_reply, Ftp::Client::old_request, and safe_free. Referenced by ftpReadCwd(), ftpReadMdtm(), and ftpReadSize(). References Config, Ftp::Channel::conn, Ftp::Client::ctrl, debugs, Ftp::escapeIAC(), SquidConfig::Ftp, Comm::IsConnOpen(), JobCallback, Ftp::CtrlChannel::last_command, Ftp::CtrlChannel::last_reply, NULL, safe_free, Ftp::Client::scheduleReadControlReply(), SquidConfig::telnet, Comm::Write(), Ftp::Client::writeCommandCallback(), and xstrdup. Referenced by dataChannelConnected(), ftpReadPORT(), ftpSendCwd(), ftpSendList(), ftpSendMdtm(), ftpSendMkdir(), ftpSendNlst(), ftpSendPass(), ftpSendPORT(), ftpSendQuit(), ftpSendRest(), ftpSendRetr(), ftpSendSize(), ftpSendStor(), ftpSendType(), ftpSendUser(), Ftp::Relay::sendCommand(), Ftp::Client::sendEprt(), Ftp::Client::sendPassive(), and Ftp::Relay::startDirTracking(). References StatCounters::all, CommCommonCbParams::conn, DBG_IMPORTANT, debugs, Comm::ERR_CLOSING, ERR_WRITE_ERROR, Ftp::Client::failed(), CommCommonCbParams::fd, fd_bytes(), FD_WRITE, CommCommonCbParams::flag, StatCounters::ftp, StatCounters::server, CommIoCbParams::size, statCounter, CommCommonCbParams::xerrno, and xstrerr(). Definition at line 2679 of file FtpGateway.cc. References Client::addVirginReplyBody(), debugs, and HERE(). Referenced by printfReplyBody(), and processReplyBody(). 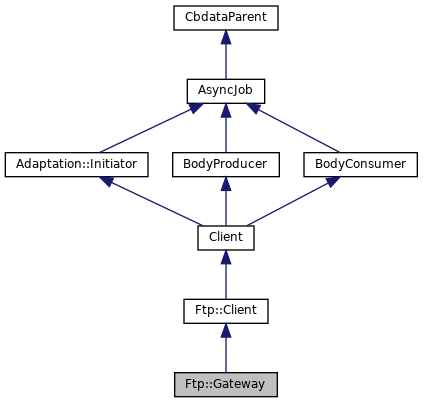 Referenced by Client::adaptOrFinalizeReply(), Client::addVirginReplyBody(), Client::cleanAdaptation(), Client::doneWithAdaptation(), Client::noteAdaptationAclCheckDone(), processHeadResponse(), Ftp::Relay::processReplyBody(), HttpStateData::processReplyBody(), and processReplyBody(). Definition at line 106 of file FtpGateway.cc. Referenced by buildTitleUrl(), and ~Gateway(). Definition at line 104 of file FtpGateway.cc. Definition at line 107 of file FtpGateway.cc. Referenced by Ftp::Client::abortAll(), Ftp::Relay::abortOnData(), Ftp::Client::Client(), Ftp::Client::closeServer(), completedListing(), completeForwarding(), Ftp::Client::connectDataChannel(), Ftp::Relay::createHttpReply(), Ftp::Client::ctrlClosed(), Ftp::Client::doneWithServer(), Ftp::Client::failed(), failedHttpStatus(), ftpAcceptDataConnection(), ftpFail(), ftpOpenListenSocket(), ftpReadCwd(), ftpReadEPRT(), ftpReadEPSV(), ftpReadList(), ftpReadMdtm(), ftpReadMkdir(), ftpReadPass(), ftpReadPORT(), ftpReadRest(), ftpReadRetr(), ftpReadSize(), ftpReadTransferDone(), ftpReadType(), ftpReadUser(), ftpReadWelcome(), ftpSendReply(), ftpWriteTransferDone(), hackShortcut(), Ftp::Relay::handleControlReply(), handleControlReply(), Ftp::Client::handleControlReply(), Ftp::Client::handleEpsvReply(), Ftp::Client::handlePasvReply(), haveControlChannel(), listenForDataChannel(), loginFailed(), Ftp::Client::parseControlReply(), Ftp::Client::readControlReply(), Ftp::Relay::readCwdOrCdupReply(), Ftp::Relay::readDataReply(), Ftp::Relay::readEpsvReply(), Ftp::Relay::readFeatReply(), Ftp::Relay::readGreeting(), Ftp::Relay::readPasvReply(), Ftp::Relay::readReply(), readStor(), Ftp::Relay::readTransferDoneReply(), Ftp::Relay::readUserOrPassReply(), Ftp::Client::scheduleReadControlReply(), Ftp::Client::sendPassive(), Ftp::Relay::serverComplete(), start(), Ftp::Relay::startDirTracking(), Ftp::Relay::stopDirTracking(), Ftp::Client::switchTimeoutToDataChannel(), Ftp::Client::writeCommand(), and ~Gateway(). Definition at line 117 of file FtpGateway.cc. Referenced by completedListing(), ftpReadCwd(), handleControlReply(), and ~Gateway(). Referenced by Ftp::Relay::abort(), Ftp::Client::abortAll(), Ftp::Relay::abortOnData(), Ftp::Client::closeServer(), completeForwarding(), Ftp::Client::connectDataChannel(), Ftp::Relay::dataChannelConnected(), dataChannelConnected(), Ftp::Client::dataClosed(), Ftp::Client::dataComplete(), Ftp::Client::dataConnection(), Ftp::Client::dataRead(), Ftp::Client::doneWithServer(), ftpAcceptDataConnection(), ftpOpenListenSocket(), ftpReadList(), ftpReadPORT(), ftpReadRetr(), ftpSendPORT(), Ftp::Relay::handleDataRequest(), Ftp::Client::handleEpsvReply(), Ftp::Client::handlePasvReply(), Ftp::Client::initReadBuf(), listenForDataChannel(), Ftp::Client::maybeReadVirginBody(), Ftp::Relay::mayReadVirginReplyBody(), parseListing(), Ftp::Relay::processReplyBody(), processReplyBody(), readStor(), Ftp::Client::scheduleReadControlReply(), Ftp::Client::sendEprt(), Ftp::Client::sendPassive(), Ftp::Relay::startDataDownload(), Ftp::Relay::startDataUpload(), Ftp::Client::switchTimeoutToDataChannel(), timeout(), and Ftp::Client::~Client(). Definition at line 113 of file FtpGateway.cc. Referenced by ftpTraverseDirectory(), htmlifyListEntry(), and ~Gateway(). Referenced by Client::completeForwarding(), Ftp::Client::ctrlClosed(), HttpStateData::httpStateConnClosed(), and Client::swanSong(). Referenced by Client::abortOnBadEntry(), appendSuccessHeader(), Client::blockCaching(), HttpStateData::buildRequestPrefix(), Client::Client(), completedListing(), HttpStateData::continueAfterParsingHeader(), Ftp::Client::dataRead(), Ftp::Relay::failed(), Ftp::Client::failed(), Ftp::Relay::failedErrorMessage(), Ftp::Relay::forwardReply(), ftpAcceptDataConnection(), ftpFail(), ftpSendReply(), ftpWriteTransferDone(), Gateway(), Client::handleAdaptationAborted(), Client::handleAdaptationBlocked(), Client::handleAdaptedBodyProducerAborted(), Client::handledEarlyAdaptationAbort(), Client::handleMoreAdaptedBodyAvailable(), HttpStateData::handleMoreRequestBodyAvailable(), HttpStateData::handleRequestBodyProducerAborted(), HttpStateData::haveParsedReplyHeaders(), haveParsedReplyHeaders(), HttpStateData::HttpStateData(), HttpStateData::httpTimeout(), HttpStateData::keepaliveAccounting(), listenForDataChannel(), loginFailed(), Ftp::Client::maybeReadVirginBody(), parseListing(), HttpStateData::peerSupportsConnectionPinning(), processHeadResponse(), Ftp::Relay::processReplyBody(), HttpStateData::processReplyBody(), processReplyBody(), HttpStateData::processReplyHeader(), HttpStateData::processSurrogateControl(), Ftp::Client::readControlReply(), HttpStateData::readReply(), Ftp::Relay::Relay(), HttpStateData::reusableReply(), Client::sentRequestBody(), Client::setFinalReply(), start(), HttpStateData::statusIfComplete(), Client::storeReplyBody(), Ftp::Client::timeout(), HttpStateData::wroteLast(), Client::~Client(), and ~Gateway(). Definition at line 112 of file FtpGateway.cc. Referenced by ftpGetFile(), ftpReadMkdir(), ftpSendCwd(), ftpSendList(), ftpSendMdtm(), ftpSendMkdir(), ftpSendNlst(), ftpSendRetr(), ftpSendSize(), ftpSendStor(), ftpTraverseDirectory(), ftpTrySlashHack(), hackShortcut(), and ~Gateway(). Definition at line 122 of file FtpGateway.cc. Referenced by appendSuccessHeader(), checkAuth(), checkUrlpath(), completeForwarding(), ftpFail(), ftpGetFile(), ftpListDir(), ftpReadCwd(), ftpReadList(), ftpReadMkdir(), ftpReadPORT(), ftpReadRest(), ftpReadRetr(), ftpReadTransferDone(), ftpReadWelcome(), ftpRestOrList(), ftpSendCwd(), ftpSendNlst(), ftpSendPassive(), ftpSendPORT(), ftpSendSize(), ftpSendType(), ftpTraverseDirectory(), ftpTrySlashHack(), Gateway(), haveParsedReplyHeaders(), htmlifyListEntry(), processReplyBody(), restartable(), and timeout(). Definition at line 152 of file FtpGateway.cc. Referenced by Client::adaptOrFinalizeReply(), HttpStateData::buildRequestPrefix(), Client::Client(), HttpStateData::closeServer(), Ftp::Client::closeServer(), completedListing(), Client::completeForwarding(), completeForwarding(), HttpStateData::continueAfterParsingHeader(), Ftp::Client::failed(), Ftp::Relay::failedErrorMessage(), HttpStateData::finishingBrokenPost(), ftpFail(), ftpSendReply(), HttpStateData::handle1xx(), Client::handleAdaptationBlocked(), Client::handledEarlyAdaptationAbort(), Client::handleRequestBodyProducerAborted(), HttpStateData::handleRequestBodyProducerAborted(), HttpStateData::haveParsedReplyHeaders(), HttpStateData::HttpStateData(), HttpStateData::httpTimeout(), loginFailed(), HttpStateData::processReplyBody(), Ftp::Relay::readDataReply(), HttpStateData::readReply(), readStor(), Client::sendBodyIsTooLargeError(), Ftp::Relay::sendCommand(), Ftp::Client::sendPassive(), Client::sentRequestBody(), Ftp::Relay::serverComplete(), start(), Client::startAdaptation(), Ftp::Relay::startDirTracking(), Ftp::Relay::stopOriginWait(), Client::swanSong(), Ftp::Relay::updateMaster(), HttpStateData::wroteLast(), and Ftp::Client::~Client(). Definition at line 116 of file FtpGateway.cc. Definition at line 120 of file FtpGateway.cc. Referenced by completedListing(), parseListing(), and processReplyBody(). Definition at line 108 of file FtpGateway.cc. Definition at line 109 of file FtpGateway.cc. Referenced by appendSuccessHeader(), ftpFail(), ftpReadMdtm(), and ftpSendReply(). Definition at line 118 of file FtpGateway.cc. Referenced by hackShortcut(), and ~Gateway(). Referenced by Ftp::Client::failed(), ftpSendReply(), hackShortcut(), unhack(), and Ftp::Client::~Client(). Definition at line 100 of file FtpGateway.cc. Referenced by buildTitleUrl(), checkAuth(), ftpSendPass(), Gateway(), loginParser(), and start(). Definition at line 101 of file FtpGateway.cc. Referenced by buildTitleUrl(), failedHttpStatus(), loginFailed(), and loginParser(). Definition at line 111 of file FtpGateway.cc. Referenced by ftpReadType(), ftpTraverseDirectory(), ftpTrySlashHack(), hackShortcut(), and ~Gateway(). Definition at line 115 of file FtpGateway.cc. Definition at line 102 of file FtpGateway.cc. Definition at line 103 of file FtpGateway.cc. Referenced by appendSuccessHeader(), HttpStateData::buildRequestPrefix(), buildTitleUrl(), checkAuth(), HttpStateData::checkDateSkew(), checkUrlpath(), completedListing(), HttpStateData::continueAfterParsingHeader(), Ftp::Relay::forwardPreliminaryReply(), ftpFail(), ftpReadType(), ftpRealm(), ftpSendPassive(), ftpSendReply(), ftpSendStor(), ftpSendType(), ftpSendUser(), ftpTrySlashHack(), Gateway(), HttpStateData::handle1xx(), Client::handleAdaptationBlocked(), Ftp::Relay::handleControlReply(), Client::handledEarlyAdaptationAbort(), HttpStateData::handleMoreRequestBodyAvailable(), HttpStateData::haveParsedReplyHeaders(), HttpStateData::HttpStateData(), HttpStateData::keepaliveAccounting(), Client::maybePurgeOthers(), Client::noteAdaptationAclCheckDone(), Client::originalRequest(), HttpStateData::peerSupportsConnectionPinning(), HttpStateData::persistentConnStatus(), HttpStateData::processReplyBody(), processReplyBody(), HttpStateData::processReplyHeader(), HttpStateData::processSurrogateControl(), HttpStateData::readReply(), restartable(), HttpStateData::reusableReply(), Client::sendBodyIsTooLargeError(), HttpStateData::sendRequest(), Client::sentRequestBody(), start(), HttpStateData::statusIfComplete(), HttpStateData::truncateVirginBody(), and HttpStateData::wroteLast(). Definition at line 114 of file FtpGateway.cc. Referenced by ftpReadRest(), ftpSendRest(), hackShortcut(), and restartable(). Referenced by failedHttpStatus(), ftpFail(), ftpReadList(), ftpReadPORT(), ftpReadRetr(), ftpSendCwd(), ftpSendList(), ftpSendMdtm(), ftpSendMkdir(), ftpSendNlst(), ftpSendPass(), ftpSendPassive(), ftpSendPORT(), ftpSendQuit(), ftpSendRest(), ftpSendRetr(), ftpSendSize(), ftpSendStor(), ftpSendType(), ftpSendUser(), Ftp::Relay::handleControlReply(), handleControlReply(), Ftp::Client::handleControlReply(), Ftp::Client::handleEpsvReply(), loginFailed(), readStor(), Ftp::Relay::sendCommand(), Ftp::Client::sendEprt(), Ftp::Client::sendPassive(), start(), Ftp::Relay::startDataDownload(), Ftp::Relay::startDataUpload(), and timeout(). Definition at line 110 of file FtpGateway.cc. Referenced by appendSuccessHeader(), ftpFail(), ftpReadSize(), ftpSendPassive(), processReplyBody(), and restartable(). Definition at line 105 of file FtpGateway.cc. Referenced by buildTitleUrl(), ftpListDir(), ftpReadSize(), and ~Gateway(). Definition at line 119 of file FtpGateway.cc. Referenced by appendSuccessHeader(), checkUrlpath(), ftpRestOrList(), ftpSendType(), and htmlifyListEntry(). Definition at line 99 of file FtpGateway.cc. Referenced by buildTitleUrl(), checkAuth(), ftpRealm(), ftpSendUser(), Gateway(), loginParser(), and start().